A referrer is a registered healthcare professional who is entitled, in accordance with IR(ME)R Procedure 2, to refer individuals for medical exposure to a practitioner. The Regulations do not allow the patient to be a referrer. Physicians’ associates cannot be entitled as referrers under IR(ME)R 2017 as they are not currently registered healthcare professionals. Although formal written consent is not usually required for minor procedures/examinations, the referrer should obtain verbal consent from the individual to be exposed for a referral to Imaging and, when appropriate, discuss any associated risks. Arrangements for the Trust providing, where practical, adequate information relating to the benefits and risks associated with the exposure (prior to the exposure taking place) are given in IR(ME)R Procedure 12. The referrer must supply the practitioner with sufficient medical data, such as results of previous diagnostic or imaging investigations or medical records, relevant to the medical exposure requested by the referrer to enable the practitioner to decide whether there is sufficient net benefit as required by Regulation 6(1)(a) to enable justification for the exposure to go ahead. Provide sufficient information so that the individual can be uniquely identified in accordance with IR(ME)R Procedure 1 i.e. patient full name, address, date of birth and hospital PID. For patients referred by a general practitioner (GP) the minimum requirement is full name, address and date of birth, so that the patient can be accurately and uniquely identified. Supply sufficient medical data and a clear clinical question to enable the examination to be justified for medical exposure i.e. clinical diagnosis, relevant past history, previous exposures relevant to the condition being investigated, clinical findings on the examination, relevant medication, known pregnancy status in line with IR(ME)R Procedure 4, breast feeding (for Nuclear Medicine procedures), any available histology, laborotory results i.e. INR, Creatinine and GFR, whether the examination is for non-medical imaging or research purposes. For research trials, provide trail name and study time point. Supply their own details, including a signature (plus clearly legible name, job title and contact number) uniquely identifying the referrer. If an electronic request is submitted the ICT network individuals login credentials will act as a digital signature. Ensure duplicate requests are not entered into the system. NB. The person requesting the examination MUST be the referrer taking responsibility for the examination or treatment requested. Failure to adequately complete an imaging request as defined above will result in a delay to your request being processed or ultimately being rejected. GP Referrals: We actively encourage the submission of an electronic referral via the iCare Vortal in order to avoid any potential delays in obtaining diagnostic imaging and results. Instructions on how to do this are available here. If you do not have access to this system and wish to submit an application please click here. Alternatively a hard copy of our Imaging Referral Form is available. Internal Referrals (HGS): All referrals must be submitted through Concerto. In the event of a system failure a hard copy referral form should be submitted to the relevant department. Under IR(ME)R 2017, all referrals for radiological examinations need to be justified, authorised and protocolled in line with this legislation. Our new referral guidelines are evidence based and offer increased support, ensuring the best use of radiology services. Further supported by the Royal College of Radiologists – Making the best use of clinical radiology services Referral Guidelines 2007. This has more recently been superseded by the eighth edition of iRefer which is now available online and in booklet format. 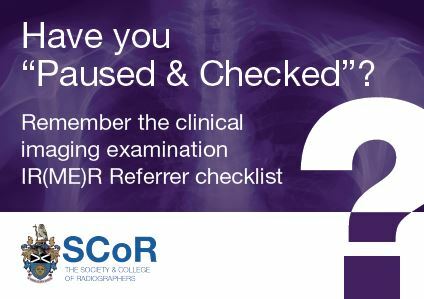 NB: If you have any questions relating to the protocols or need further clarification on any issue relating to the IR(ME)R regulations please contact a Consultant Radiologist or Advanced Practitioner Radiographer who will be happy to offer assistance and support as appropriate. RADIOL 6, June 2018– The imaging department launched a Quality Improvement project, RADIOL 6, with the aim of improving the quality of clinical information supplied on imaging requests. Clinical Alert, 2018 – Incorrect patient referrals for imaging tests. As a result of the incorrect patient details being inputted into the electronic radiology requesting system patients have received unnecessary doses of radiation. This can result in significant delays in performing the correct test for the intended patient. There is a risk of exposing the incorrect patient to a dose of ionising radiation. Lesson of the Month, October 2016 – Radiation Related Incidents. It is everyone’s responsibility to ensure the right patient has the correct examination and is not irradiated unnecessarily. All imaging reports can be found on Concerto. In addition, urgent reports are emailed directly to consultant referrals internally, these can also be delegated to another member of staff to receive as well. Other reports are sent via daily reports or when each report is issued – depending on referral preferences. Rejected requests are also emailed back to the consultant and referrer with information on why the request is rejected.